The MH230 is a great radio for a variety of situations. It is a cool camping gadget, a nice piece of tech for your emergency kit, and a reliable and durable means of communication when you are out fishing with the guys. There are a few limitations with the MH230; the range is not what it could be, the LCD does not function properly at all times, and the unit does not come with all the accessories that some other two way radio kits come with. With that being said, it more than makes up for those problems with its benefits. It is lightweight, for one thing. It is also durable. Hands free communication is available with the iVOX function. Additionally, privacy channels greatly expand the amount of communication you can have across the FRS and GMRS wavelengths. Has two possible power sources: NiMH rechargeable or AAA batteries. 121 privacy codes allows for a myriad of communication channels. Hands free communication via iVOX. The LCD display does not always work as well as it should. Functionality is limited when the battery power starts to go down. No silent use function (no vibration). 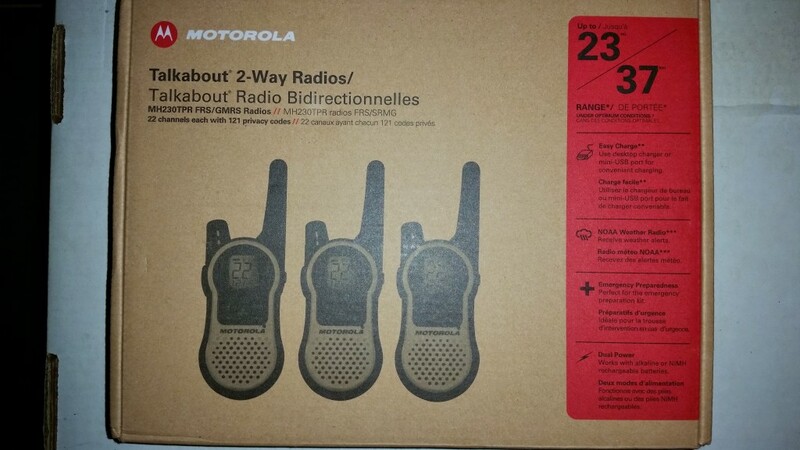 If you are looking for a good, solid, and durable radio which will get you through a variety of situations and keep you in communication, the Motorola MH230 Two Way Radio is a good choice. It is not the best on the market, nor is it the cheapest (or most expensive), but it does have everything you will need and is a steal for the price point that it is listed at. Do yourself a favor and take a look at this one. The casing of the MH230 is hard black plastic. The front of the unit has a yellow plastic cover with a panel of buttons comprised of soft rubber. They are easy to push, however, so there is no reason to fret over the loss of individual buttons. The bottom of the unit has a mini-USB port for charging or programming via a computer terminal. The back of the unit has the battery case and is also composed of hard black plastic (with two metallic leads through which the unit can charge). Included with the unit is a two-unit charging station and an AC adapter for charging the third unit. All of this is pretty standard, as things go. The charging base, however, is more slim than most charging stations, which is a huge benefit. You won’t have to go looking around for extra space to put the thing when you need to use it. The top of the unit has a very sturdy volume knob along with the antenna, both of which are made of hard, rubberized plastic. The left side of the unit has the push to talk button for communication and the right hand size of the unit has a port for attaching a microphone or headset. The units look good. They have a sleek, curved, design which fits easily into the hand. The buttons on the front of the unit are gray in color on a bright yellow background. The rest of the unit is either a polished or a matte black color. The LCD screen has a bright orange backlight on which black text is very easy to read. The face of the unit is yellow plastic, and is relatively shiny. This makes it easy to spot if you are out in the field and set it down somewhere. A problem with many two way radios is that they can be hard to find if they are put down. One of the first things that needs to be mentioned about this radio is the great packaging and the ease with which it can be opened. Instead of coming in the cheap bubble packs that a lot of two way radios come packaged in, the MH230 comes in a great cardboard box which is extremely easy to open. Once inside, everything is laid out logically and you can find and remove everything easily. Better still, once you have taken the things out of the box they are very easy to put back in for storage. The box itself is slim and sturdy as well, so it should be able to stand up to a bit of damage if it comes down to it. Included with the unit are NiMH battery packs for each of the 3 included radios. The radios themselves, of course, are also included, as are 3 belt clips. 1 drop-in charger is included, 1 charging adapter is included, and 3 earbuds are included. It should be noted that the earbuds which are included with the unit do not have microphones, so you will still have to pull up the unit to talk back to someone. With that being said, the MH230 is compatible with almost all of the Motorola accessory devices. This radio is a respite from many of the other radios on the market in terms of weight. 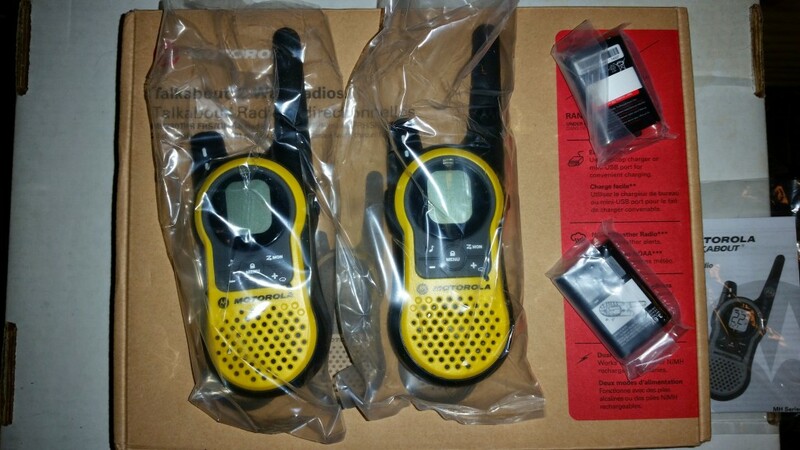 The radios are very light and are easy to hold in your hand, even with the addition of the belt clips and the batteries. 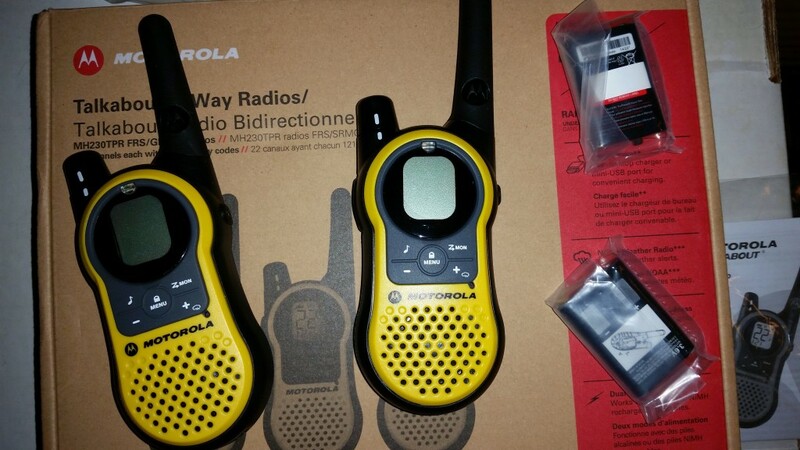 Carrying these radios around in your hand is no problem, much less carrying them in a bag or on your belt. Many radios in the same price range are unnecessarily large and heavy, which leads to issues when they are being carried on long treks or camping trips. That is not the case with the MH230. The units are very durable. Though they do not come at a super high price point and they do not have some of the extra rubberized features that other similar two way radios have, they can be dropped from hand height and not have too much of an issue. The case is lightweight, so they do not pick up too much speed on the way down. The unit is NOT waterproof and will not float if you drop it in water, however. A lot of similar models by Motorola do have that functionality, but this one does not, so you should keep that in mind if you are going to be using it in bad weather. With 22 channels and 121 privacy channels, you have plenty of options when it comes to communication. One of the issues with the radio, however, it figuring out how to switch between the channels. Rather than simply pressing the + or – buttons on the face of the unit, you have to hit the menu button first. If you then hit the PTT button you will change quickly. This might seem like it isn’t a big deal, but it is pretty confounding when you first pick up the radio to use it and it is definitely not something you will be able to figure out without using the manual. The MH230 comes with NOAA weather channels built in. These work like they are supposed to and there is really not much to say about them. Simply shift your channel over to one and it will output relevant weather and emergency information. The battery life is alright. It is 10 hours for AAA batteries. It is only 8 hours for the NiMH batteries that come with the unit. Even so, it can get a bit more than that if you aren’t using it constantly. The unit also charges pretty quickly. The first charge will take about 4 hours but the others will only take about 2 hours, depending on how depleted the battery is when you begin using it. This brings the review to the next section: the functionality. When you have low battery power (as in, not full power), you are going to have some issues with the radios. For one thing, the crispness of the communications is going to go down a bit. For another, the LCD screen begins to lose its ability to function properly as well. The black text that is displayed on the screen is not as clear as it should be. Even with the backlight which the unit comes with, the text is sometimes very hard to read. This is not something which should take away from the overall use of the device as a whole, but if you are someone who plans to use some of the very specific functions that the device offers then you are going for be in for a bit of disappointment. The maximum range for this unit is 23 miles. That is, at least, the range that is being advertised. As nearly everyone knows, however, the range is never the one that is advertised, even under perfect conditions. You can expect to get a mile, maybe two miles on a good day, out of these radios. That is enough for most people. With that being said, when you buy the radio you will definitely want to test it out for yourself under the conditions you will be using it under prior to actually starting to use it. This will ensure that you have as much information as you possibly can about how well it will function for your specific needs. 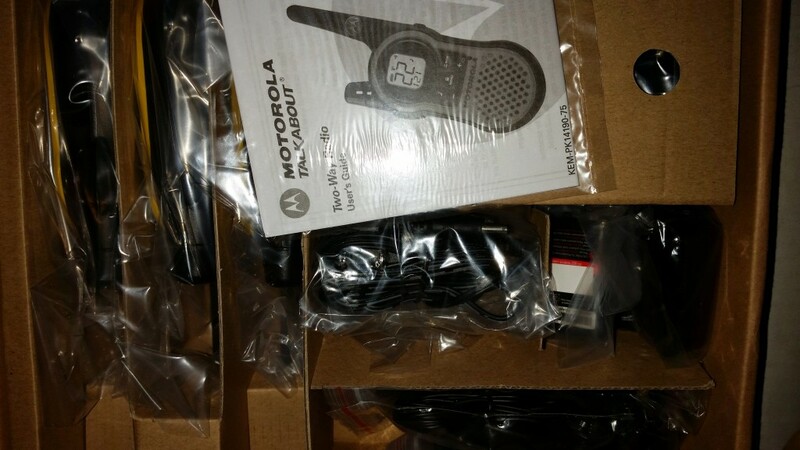 The unit is able to accept a full range of Motorola accessories. A small checklist is included with the box which lays all of this out, but it would bear mentioning regardless: wired push to talk button, isolation and electronic earmuffs, remote speaker microphones (with push to talk function), headset with boom mic, earbuds, mini USB chargers for both wall and car, flexible ear receiver, and surveillance headsets, among others. One thing to note is that all of this does not come with the unit, only works with it. A headset does come with the unit, though, which includes earbuds and a push to talk function as well. The unit comes with as many headsets as you would need for the radios contained within it. The charging cradle is both a blessing and a curse. On the one hand, it is easy to figure out and it is shaped in a way that makes it easy to place in a variety of locations. On the other hand, the radios don’t really fit snugly in it. Just to clarify what that means: they could easily fall out. You put the radio inside and tap the side of the unit and the radio is going to rock back and forth without staying in place. Even so, it takes a lot to knock it into an area where it will not still charge. Speaking of charging, it is easy to tell when your radios are charging on this base. A bright red light will light up right next to them. This is a clear step above a lot of other radios on the market which leave you wondering if anything is charging or not due to a lack of indication.